At our last meeting: Ryan continued our study in Job. We explored THE SOURCE of Jobs suffering because God was CONTESTING SATAN, however, Job nor his friends knew it at the time and were attempting to explain it from their EARTHLY PERSPECTIVES. GOD'S PERSPECTIVE was that He knew what was going on and had everything under control concerning Job's situation. JOB'S PERSPECTIVE was that he was wondering if his suffering was because he had done something wrong. Then in Job 9:33, a turning point, Job was beginning to understand that he needed a mediator, an advocate. Job 16:18. In Job 19:23,25, We learned that there is a redemptive purpose to what is happening in our suffering. Suffering helps us understand that we have a Redeemer, a hope in the after life. SUFFERING HAS A REDEMPTIVE PURPOSE. Pulled in too many directions??? Wear Comfortable Shoes by Peter Rosenberger is a great book for Caregivers. We posted this review a while back, but have new members, so sharing again: "I FLEW through these 115 pages offered from this loving husband who has faced many of the same things I have. Mr. Rosenberger has been doing this for 19 years longer than I have, and I learned much from him. He has written personally, sharing his own experience (which includes Gracie's 70+ operations), and with tons of practical advice (including how to ASK for help and where the Church fits in). He gets right to the point for the reader whose time is limited." L.P.
O Lord, my heart is not lifted up; my eyes are not raised too high; I do not occupy myself with things too great and too marvelous for me. But I have calmed and quieted my soul, like a weaned child with its mother; like a weaned child is my soul within me. O Israel, hope in the Lord from this time forth and forevermore. Are you struggling to balance your care giving, personal and marriage roles? Feeling overwhelmed by too many responsibilities, isolation, or lack of support? Are you worn out from taking care of everyone else at the expense of your own needs? "I find it to be almost impossible to be STRESSED and praise God at the same time. When I'm STRESSED I just start praising and the STRESS just seems to go away." anon. 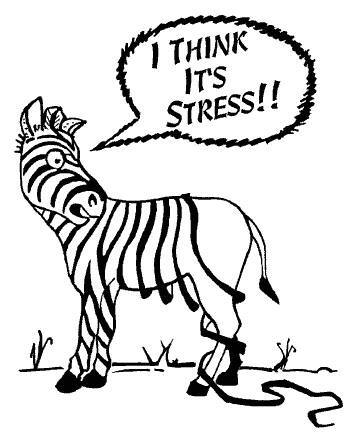 Our Theme for MAY is STRESS. We look forward to a devotional time around God's word, worship in song, and breakfast as a group. Then we have a time of sharing for updates, needs and prayer time. Our Loved Ones are welcome to join us for all or part of the meeting but volunteers are available to assist them on a walk, on a walk or in the next room during the sharing time if desired. A light breakfast with healthy options will be served. If you would like to contribute, contact Sarah Dougherty at doughertyfam8@gmail.com Thank you! Scott & Judy - Scott needs encouragement in dealing with Judy's dementia. He needs help also. Becky - Continued adjustment and heart stress test in June. Adjustment to having Dad living with us. Some of our lives have become so difficult. We are exhausted before our feet ever touch the floor many mornings. Each day is like the one before and today, and tomorrow, will be no different. Some of us are so tired. Taking care of our loved ones is wearing us out. Cooking, cleaning, shopping, and doctor appointments: my life is a merry-go-round that is spinning faster and faster and I can’t get off. Then there’s the laundry. The mounds of wash pile up faster than the machines and I can get them done. Oh Lord, please help us! "Renew and refresh our bodies, our minds and our spirits each night so that when we awake our thoughts are of you rather than lists of tasks that remain undone from yesterday. Help us to focus on the present instead of looking at the road ahead. Whisper your love to us in the gentle touches of our families as we pat a head or hug shoulders, rub tired feet or scratch an itching back." "Give us eyes to see the splashes of color – perhaps a vibrant red rose or the shining yellow of a sunflower – you have planted along our path as we run errands. As a caregiver, let us be a conduit allowing your love to pour through to those who need our assistance to make it through each day." "Lord, I'm just having some trouble managing this STRESSFUL time in my life. The STRESS is just getting to be too much for me, and I need your strength to get me through. I know you are a pillar for me to lean on in tough times, and I pray that you will continue to provide me with ways to make my life a little less burdensome. "Lord, I pray that you provide me your hand and walk me through the dark times. I ask that you reduce the burdens in my life or show me the path to get things done or rid myself of the things weighing me down. Thank you, Lord, for all you do in my life and how you will provide for me, even in these STRESSFUL times." I pray that you will be with (name). They feel they are under a tremendous amount of STRESS at this time. Help them to distinguish between good and bad STRESS: the STRESS that urges them to a higher plane; and the STRESS that pushes us over the edge. God, you must know what STRESS and pressure is all about. Free (name) from the STRESS and PRESSURE so they can be free to do your will for them in their lives. In the name of Your son and our Savior. “Take a deep breath, Mom.” That’s what my son-in-law, Ryan said to me the other day. It was exactly what I needed to hear at the time. The afternoon had been chaotic. On my way back from my chiropractor, where I’ve been getting a series of treatments for a very painful neck, I got a call from my sweet mother, who was being taken to the hospital from her own doctor’s appointment, by ambulance. Her doctor was rightly concerned about her escalating symptoms, and she needed a higher level of care, and better diagnosis of what was going on with her heart. I used to think Doctors were coping out when they blamed symptoms on "STRESS." Not anymore. When discussing my high blood pressure, my doctor brought up the burden of caring for Gary, and I said, "But I've been doing this for 8 years and never had any physical problems." She answered, "Yes, but you're 8 years older now." I don’t know for sure if my health issues ARE due to stress, but they certainly draw attention to my “full plate.” Doctors are telling me to manage stress, friends are really concerned and people I barely know are asking me if I’m feeling ok. (I must look tired or something.) So, I’ve been looking at how full my plate has been lately. What's on the plate? The daily tasks of life and the STRESSES that come and go. All while not feeling well. I am not trying to be a superhero. I’m just doing the “next thing” that needs to be done. Whether brushing Gary’s teeth, going for a MRI, shipping a greeting card order, or picking up a prescription for a loved one, we do what we need to. It’s our joy and privilege to help those we love, and keep things running smoothly. You know what this is like. So we make changes if we can, and if we can’t we live with acceptance and flexibility For those of us who are Christians, we trust that God is with us in the midst and has a perfect plan with our lives which we don’t always understand. I want to live close to His side, abiding with him and drawing on His strength. The apostle Paul had way more troubles than I do but this is encouraging. SAY NO - Accept that I can’t do everything I want to especially when I don’t feel good. SAY YES - to a change of pace. Diversions are refreshing. EAT HEALTHY - Juicing anti-inflammatory vegies. (Recently learned that stress causes inflammation.) I’ve been enjoying a spinach, carrot, apple, ginger combo. EXERCISE - Even a 20 minute walk is invigorating. GO TO THE DOCTOR - Getting some medical issues of my own looked at. Copyright © 2014 Grace Community Church, All rights reserved.